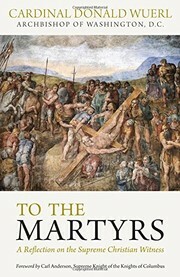 1 edition of To the Martyrs found in the catalog. Add another edition? Are you sure you want to remove To the Martyrs from your list? Published November 12, 2015 by Emmaus Road Publishing in Steubenville, Ohio, USA . In many societies today, the utterance of a simple phrase, "I am a Christian," is a crime punishable by death. So widespread is this persecution that Pope Francis called it a "third world war, waged piecemeal …a form of genocide." In To the Martyrs: A Reflection on the Supreme Christian Witness, Cardinal Donald Wuerl urges solidarity with today's persecuted Christians and recounts the recurrence of martyrdom throughout Church history. His Eminence's poignant insight into the spirituality of martyrdom will challenge all Christians to courageously emulate the steadfast commitment of those who have followed Christ—even unto death.